The World's Most Accurate NTP Server Hardware? This is a Soekris net4501 computer modified to use a TAPR Clock-Block frequency synthesizer and a TAPR FatPPS signal conditioner. When fed with a quality reference signal at 10MHz to drive the system clock, and a quality PPS signal to provide timetags, it can keep time to within a few hundred nanoseconds (here are plots of how my herd of Soekri are performing). 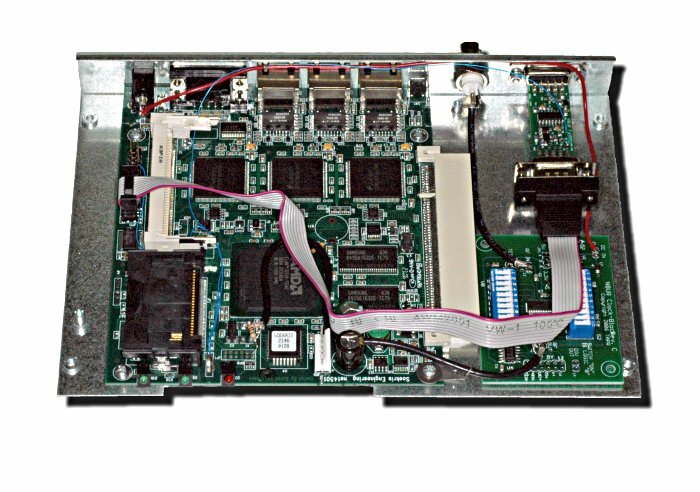 The secret to the net4501's timekeeping capability is its use of an AMD Elan SC520 CPU which has internal time registers with a resolution of about 100 nanoseconds. With a little hardware and software magic (figured out by Poul-Henning Kamp), this timer can be used to capture PPS timetags far more precisely, and with much less jitter, than the traditional method of using an RS-232 serial port control line as the input. 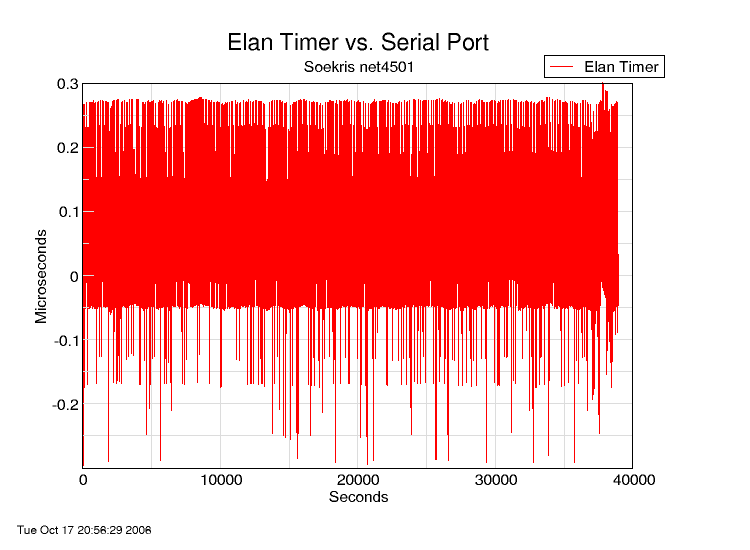 The following two graphs show first, a comparison of the same PPS signal as captured by the net4501 serial port (blue trace) and as captured by the Elan timer (red trace), and then a close-up view of the Elan data. These plots cover about 10 hours of data. This shows that the current offset between the system clock and the PPS stream is 0.16 microseconds, or 160 nanoseconds. The frequency error of -0.040 ppm is due to the fact that the synthesized clock frequency is offset 0.333... Hz from the integer value that the FreeBSD kernel uses in its calculations. The "jitter" and "estimated error" values are meaningless; they are the hard-coded minimums that NTP displays. Note that my claim above is for the server hardware -- most of us use the reference NTP protocol implementation, ntpd, but Poul-Henning has written his own version, ntpns, which he convincingly claims offers much better performance when used with hardware like this. Unfortunately, at the moment ntpns doesn't support most of the reference clock hardware I'm using, so I'm not able to run it here. WARNING: By installing these hardware mods, you will void the warranty on your Soekris computer at least four separate and distinct times. Proceed at your own risk! This assumes you're using nanoBSD, which is a stripped down version of FreeBSD. 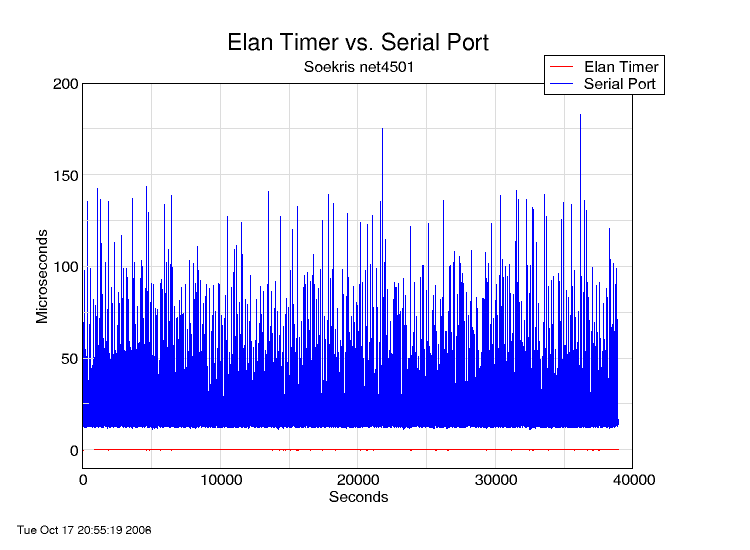 The PPS signal driving the Elan timer must be a positive pulse (going from 0 volts to 5 volts at the on-time point) and must be at least one timer tick long -- that means at least 1 millisecond (and preferably 2 or 3 ms to allow room for error) if the "HZ" value in the kernel is set to 1000 as recommended below. If your signal does not meet these requirements, a TAPR FatPPS can condition the signal to these values. 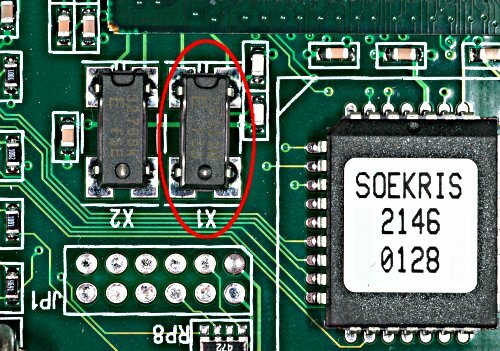 Mounting the FatPPS inside the Soekris case makes for convenient access to the PPS signal, so you might want to use it even if your PPS signal meets this requirement. To implement high-performance timekeeping, you need to modify the net4501 board to accept an external clock signal, as well as use the high resolution timer. 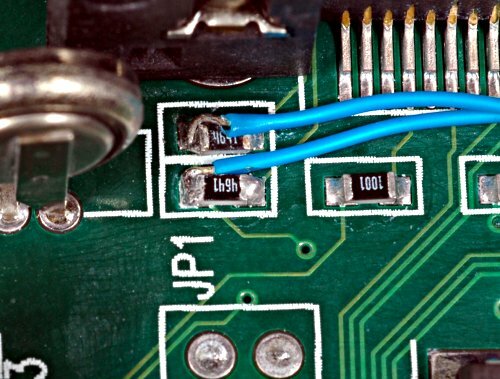 These steps require fairly good soldering skills as the surface mount components on the board are tiny; if you're unsure of yourself, find someone with SMT soldering experience to help you. Locate and remove the Soekris clock crystal (X1). 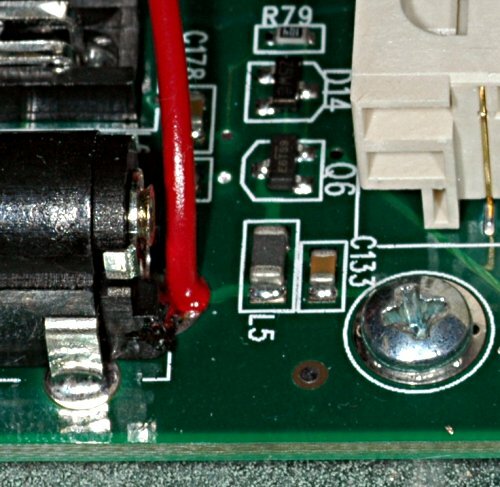 A small heat gun is the best way to do this, but with care a soldering iron and solder wick can be used to lift the part. 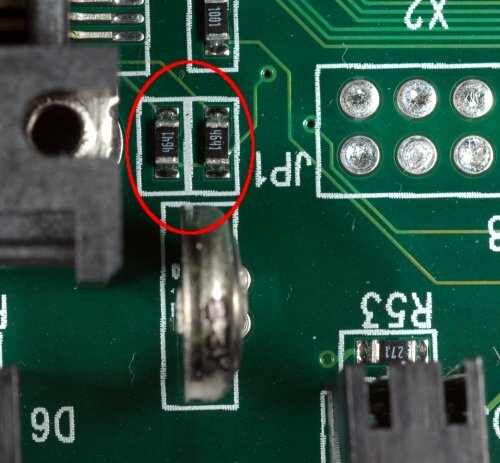 The only pin on X1 that we'll use is the one in the upper left corner, so make sure you don't damage that solder pad. 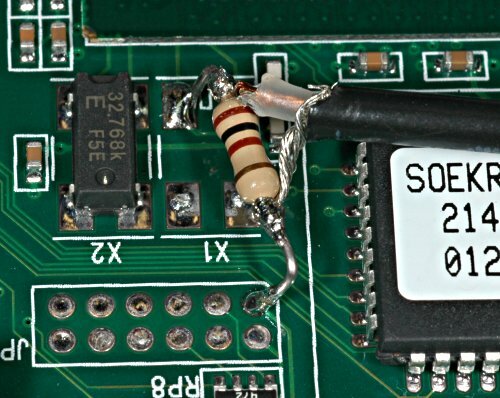 A 100 ohm resistor provides a good load for the Clock-Block and also drops its output signal enough to be compatible with the Soekris' 2.5 volt logic level. Wire up something like the piece of RG-174 cable and resistor shown below. The cable should be long enough to reach the output connector of the Clock-Block. Run a wire from the junction of R61/R62 (near the backup battery) to one of the GPIO pins (I used PIO0, which is on JP3, pin 3). Run a second wire from the R61-R62 junction to the PPS source (e.g., the FatPPS output). Connect the RG-174 coax to the Clock-Block output. Configure the Clock-Block to generate 33.333333 MHz from your external reference frequency; the Clock-Block Manual has programming information. Also, make sure the Clock-Block is jumpered for 3.3 volt operation. 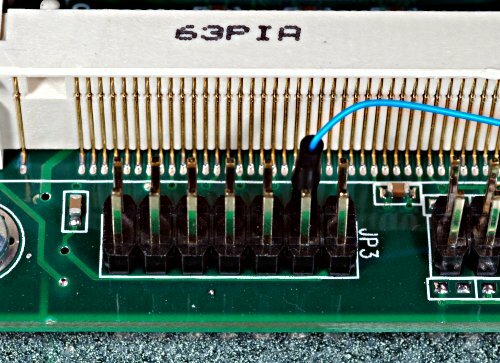 If your reference clock provides a time code as well as a PPS signal, you can use a standard DB-9 ribbon cable to connect to J3; that's the input for the second serial port on the Soekris. If you are using the standard Soekris case, you will need to drill a couple of holes in it. One is for the clock signal coming in to the Clock-Block board, and the second is for the PPS signal. 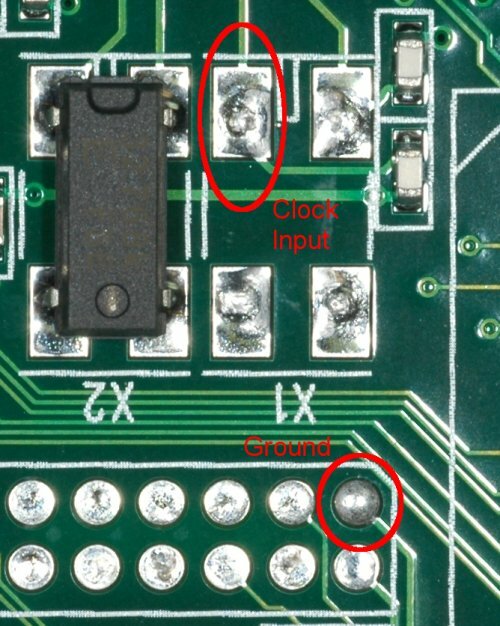 The clock signal should probably use a BNC jack for easy connection, though any RF connector will work. 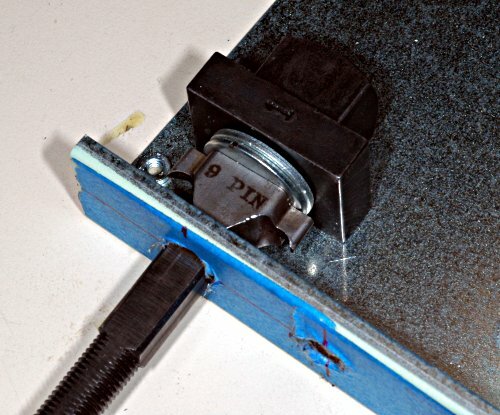 A DB-9 connector (technically, a DE-9M) is best for the PPS signal, but cutting a hole for that shape requires either patience and skill with a drill and file, or a Greenlee chassis punch. If you use a Greenlee punch to mount the FatPPS, you need to be careful to position the hole so that the punch parts will clear the various standoffs mounted inside the Soekris case. The best bet is to put the center of the pilot hole about 7/16 inch down from the top lip of the case, and about 1 1/32 inch in from the left edge. 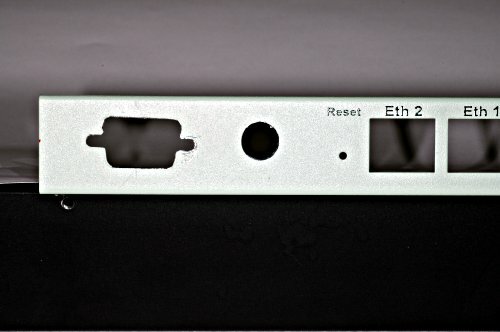 The BNC connector for the Clock-Block should be about 2 1/4 inches from the left edge. The Greenlee punch is just a little too tall to fit under the top edge of the case. To get a clean punch, we added two 3/8 inch washers (7/8 inch outside diameter), with the center drilled out to 7/16 inch, to the punch assembly (see the photos to see how this is done). 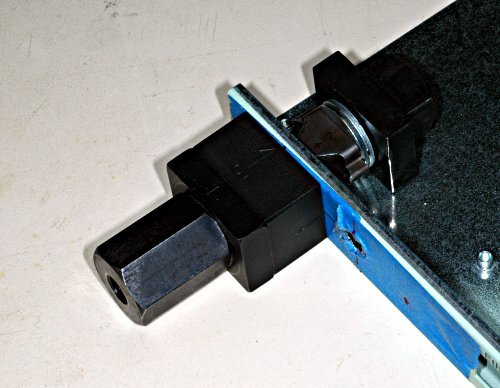 This allows the punch to drive all the way through the chassis without hitting the top lip. because the kernel PPS sync is broken with the current FreeBSD 6.1 kernel and the Soekris hardware, and it doesn't do you any good in this configuration, anyway. for the first (GPIO0) GPIO line. The tos mindist line is useful when the coarse time source has several milliseconds of jitter, which is the case with most ASCII timestamps. This parameter sets the maximum spread between prefer peer and the PPS source. Setting it to a higher value than the default of 1 millisecond helps reduce "clock-hopping" by allowing the prefer peer and the PPS source to have a wider offset -- serial port timestamps often have 5 ms or more of jitter. Setting it to 10 milliseconds, as shown in the example, should provide enough margin for most systems. Burn the nanoBSD image to a CF card, insert it in the Soekris, and you should be ready to go.